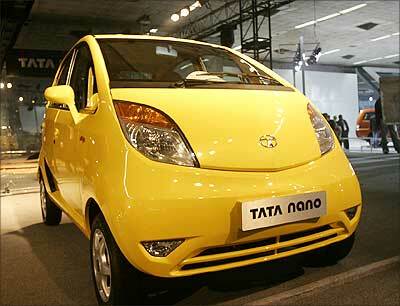 Stung by dwindling sales of the Nano, the world's cheapest car, Tata Motors has embarked on a nationwide campaign to promote and market it. The move is to reach out to the class of buyers for whom the car was originally made. 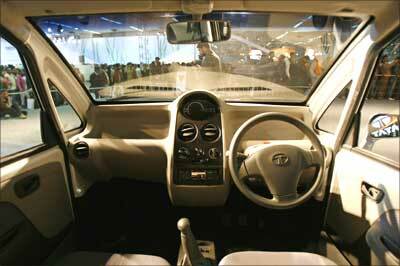 Senior executives at Tata Motors are pulling out all stops to put in place initiatives. These include facilitating better coordination between banks and customers, tie-ups with regional finance institutions and opening newer avenues for a better reach to the end-consumer, among several others. Top executives like R Ramakrishnan, vice president (commercial), passenger car business unit, and Girish Wagh, vice president and head of small car projects, have been visiting several dealers to overlook and implement the new initiatives. 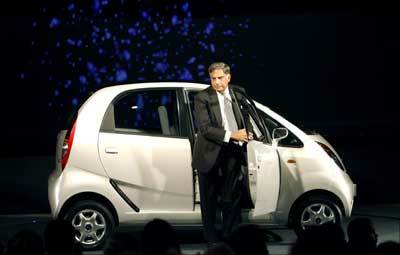 Image: Tata Group chairman Ratan Tata with the Nano. This renewed drive by the Rs 92,500-crore (Rs 925 billion) company coincides with a staggering drop in sales of the Nano, at 509 units in November as compared to 9,000 units recorded in June. 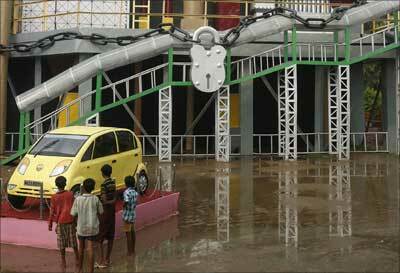 Financing has been one of the biggest trouble areas for Tata Motors, with the profile of the customer being questioned. Said company officials: "We are trying to bridge the gap between the two-wheeler buyer and a car buyer. That's a very critical link and that's what we are trying to establish. We are working with even the nationalised banks and cooperative banks, dealing with them from the top, middle, to the lower banks, making sure that things are working." Some financiers specialise in either two-wheelers or cars. 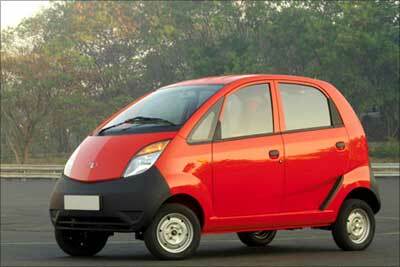 For the two-wheeler financiers, the Nano is categorised as a car. Car financiers categorise the buyers as those appropriate for a two-wheeler but perhaps not for a car. The company is trying to improve interaction between the financier and the customer. It has also begun an exchange scheme where the owner of a two-wheeler can trade his vehicle for a Nano, to be squared off against the latter's price. Usually, such exchange schemes are prevalent only within segments and never across categories. Accordingly, for prospective customers in the rural areas who have never driven a car or even visited a car showroom before, Tata Motors will set up several kiosks with the help of local dealers to enhance the presence of the car. This is primarily done to negate the perception that the Nano is still sold through a lengthy booking process. "People still think that the Nano is sold through the booking process, which makes them think there will be a waiting process. We want to remove that," added Kant. Dealers have recruited 1,200 sales persons recently to engage solely with Tata Nano customers, after a formal training process. Further recruitments are planned in other regions when the network expands. Currently, the Nano is on sale in 12 states, with the rest of the country expected to be added before the end of December, according to executives. Tata Motors is being forced to adopt a marketing strategy fit for a two-wheeler, as most of its prospective buyers are those which have families who can afford a motorcycle or an automatic scooter but could not go for a car. Carl-Peter Forster, managing director and CEO, told Business Standard a few days before: "These are new ways of marketing the Nano. To be frank, we are learning as we do. We market a passenger car to customers that are either never there to dream of a passenger car or they couldn't afford a passenger car. It's a very different way of marketing. It means new channels for the dealers." The Nano has not really lived up to the expectations as it witnessed a massive decline in sales to 509 units in November this year compared to 3,065 units sold in the previous month. The decline came during the month when the company had asked customers to bring back the people's car to add safety devices to prevent it from catching fire. While the company had insisted it was not a 'recall', it said that the addition of safety devices, a lesson learnt from some of its brand new Nanos catching fire, was optional. Even during October this year, Nano failed to enthuse buyers and witnessed only two per cent growth compared to the same month year ago. 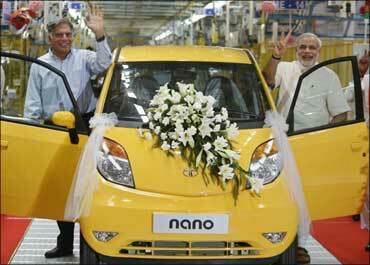 Interestingly, Nano's sales stood at 5,520 units in September this year, up 61 per cent from the same month last year. Even on a year-on-year basis, Nano's sales during November were down by 85 per cent over the same period last year. In August, the sixth incident of a Nano catching fire since the car was commercially launched in March 2009, was reported in the national capital, three months after a company probe declared the car was 'absolutely safe'. Five previous incidents were reported from across the country, including Mumbai, Lucknow, Delhi and near Vadodara in Gujarat. However, the company witnessed a marginal increase of one per cent in its total sales at 54,622 units the month compared to 54,108 units sold in the year-ago period. Its total passenger and commercial vehicle sales in the domestic market stood at 50,419 units in November, a jump of one per cent from the sale of 50,114 units in November last year, according to the company statement. Analysts say Tata's announcement inviting customers to bring in their cars for retrofits to safeguard against fire was one key reason for the poor sales figures. To a question as to why Nano sales dropped so precipitously, the company hinted at the fact that open sales of the vehicle were limited to only five states through most of November. 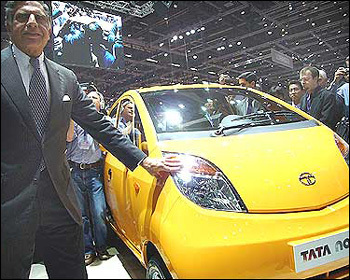 "Sales of the Tata Nano in states where we have begun open sales are increasing every month," a company official said. The country's largest exporter of passenger cars, Hyundai Motors, saw a staggering 52 per cent downturn in overseas shipments (it sold only 13,002) in November. As a result, the company recorded a 19 per cent decline in overall sales. This, despite the fact that domestic sales grew by 12 per cent in the month.